When you realize that you are at the point of separating/divorcing (or needing to resolve other family matters legally), instead of each side hiring an attorney and preparing for litigation, this process provides an option of sitting down with a mental health professional (Brad) and a former judge (Lori) who both know how to navigate these waters. Through a series of joint meetings where each and every issue that is important to both parties is addressed, the parities will work together with the guidance of the mediators to achieve resolution. At the completion of this process, a memorandum of intent to settle will be drafted and signed by the parties. After which, the parties will then hire attorneys to draft their agreement into a final legal order that will be filed and signed by the judge of their court. The financial and emotional cost saved by the parties working with each other instead of against each other is immense. The best clients are educated clients. We use a transformative mediation model with each party in one room, though we may break occasionally in to separate rooms to regroup and refocus. "Empowerment" of each of the parties is a key element to the process as we explore needs, interests, values and points of view. Prior to and between sessions, we provide parties with tools to help them stay on track and focus their attention to reaching resolution. Between sessions, parties can "try on the shoes" of agreements to see how they fit. For families with children, we have found that parents that have attended coparenting education or read Between Two Homes have a greater success rate, better follow-through, feel more empowered, and utilize their time in mediation more effectively. 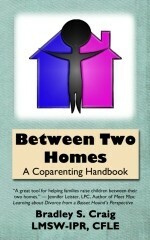 Reading Between Two Homes: A Coparenting Handbook, or Completion of the live Children in the Middle Co-parenting class or online Making Two Homes Work class is strongly recommended prior to the first session. Rates are $1,000.00 ($500.00 per side) for 1/2 day (3 hrs.) or $2,000.00 ($1,000 per side) for full day (6 hrs.). At times, lesser sessions may be requested at a rate of $250.00 per hour ($175.00 per side). For low income families, we do have options. Please contact us. For more information, click here. The primary goal of our mediation is helping families with children to settle disputes out of Court and prior to re-entering the litigation process. Our mediator, Bradley S. Craig, LMSW-IPR CFLE co-mediates with Lauren Duffer, Attorney at Law, to provide a male/female team approach bringing skills from both disciplines. Mediation is available for both Court ordered and voluntary alternative dispute resolution. Mr. Craig mediates only cases involving families with children where co-parenting matters are the primary issue. We welcome attorneys to participate in the mediation process. While property and other issues can be resolved in mediation, parents often desire to have an effective parenting plan. To assist in developing plans, we encourage parents to visit our forms page. Fees for mediation are $400.00 per side for 1/2 day (3 hr.) mediations, and $800.00 per side for full day (6 hr.) mediations with payment due in advance. To request a mediation appointment please complete an intake form and contract for mediation, then fax or scan the fully completed form along with a copy of the order for mediation (if there is one) back to us.